Automated image recognition is the new battleground for data. Facebook's trying to do it, Google's also pushing hard on this front, and now we have a new player in the field - though one which is coming at it from a somewhat smaller focus. Pinterest has today unveiled its latest search addition - the ability to search for pinned content via image. "Sometimes you spot something you really love on Pinterest, but you don't know how to find it in real life, or what it's even called. There's that perfect lamp hiding in a Pin of someone's living room, or maybe a random street style shot with the exact shoes you're looking for. Now, when you spot something in a Pin that you want to learn more about, tap the search tool in the corner. Then select the part of the Pin you're interested in, and we'll show you Pins just like it. You can even filter your visual search results by topic so you find exactly what you're looking for." It's sort of like making every pin an Ikea showroom, where you can find out more, and potentially buy, every element on display - you just hone in on the specific thing within the image you want and Pinterest will try and find it for you. Of course, as with all image recognition systems, there will be some limitations, but the addition could make it easier to discover new content on the platform, which will be particularly relevant, from an ecommerce perspective, to lifestyle content type searches, such as the one shown in above the example - the search results displayed show that the lamp is called an 'Antique Metal Funnel Pendant", simplifying the discovery process and connecting you direct to the company that sells it (so long as they're also on Pinterest). The move is the latest in Pinterest's efforts to capitalize on the platform's strength as a search and discovery platform. Recently, the visual network hit 100 million monthly active users while also reporting an 81% increase in on platform search activity over the 12 months. That increase is of major significance, particularly when matched with research on how Pinterest users use the platform to research potential purchases - a study by Millward Brown found that 87% of pinners have purchased a product because of Pinterest, while a massive 93% of pinners have used the platform to plan a future purchase. Interestingly, the demographic make-up of Pinterest is also shifting - while the network clearly skews towards female users, male pinners have increased 120% in 2015. Pinterest is also looking to ramp up commercial opportunities, rolling out Buyable Pins earlier this year (there are now more than 60 million buyable pins on the platform). Improving on-platform search is another step in the path to making Pinterest an irresistible location for online retailers - and given the engagement and growth figures, they may just be tracking down the right path to becoming one of the bigger players in ecommerce. Of course, the accuracy of the new visual search option will dictate its relative success. In a research paper released to accompany today's launch, the Pinterest engineering team has detailed how they've used their Related Pins matching system to correlate visual signals and improve their search matches. "To find visually similar results for a Pin, we consider the similarity scores of a given feature to billions of other features. In order to do this task efficiently, we built a distributed index and search system (using open-source tools) that allows us to scale to billions of images and find thousands of visually similar results in a fraction of a second." 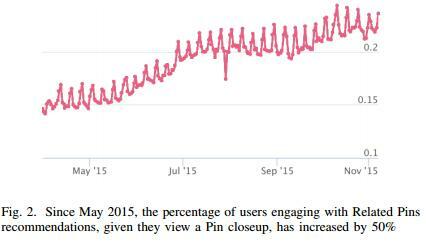 Pinterest notes that their current Related Pins matching system has improved user engagement and traffic on pin recommendations by more than 50% from May 2015 to November 2015, demonstrating the effectiveness of their system. Such insights suggest that their new search by image addition could be a big hit, detecting relevant and engaging content for users and helping fuel better on-platform discovery. The new Pinterest visual search tool will be made available to all mobile and desktop users from tomorrow.